The purpose of this post today is to bring your attention to a very important fund raising campaign that is happening across the country to help stop childhood hunger in America. As mentioned in The Food Network, The Great American Bake Sale is hosting its fourth national campaign where people, from everywhere in the country can host their own bake sale and donate the entire profit of the sale to Share Our Strength to help end childhood hunger. The following text is extracted from Share Our Strength website. Tonight over 12million children in America will go to bed wondering if they will have something to eat in the morning. A survey conducted in February by the Broward Regional Health Planning Council and paid for by the Children’s Service Council showed that nearly two-thirds of low-income families can’t always afford to give their children a balanced meal. It is hard to believe that in a country with unlimited resources, millions of children are at risk of hunger. 13.4 million children in America live in poverty today, representing roughly 1 in 6 children. More than 13% of Americans- 38 million – live below the poverty threshold of $19,800 for a family of four. The scientifically recognized consequences of hunger are both devastating and lifelong: poorer overall health, reduced social and psychological well-being; and lower academic achievement. This is why Share Our Strength’s Great American Bake Sale believes that America can- and must – end childhood hunger by providing a fun and easy way for individuals, families, business, students and organizations to make a difference for those children at risk of hunger. Share Our Strength, one the nation’s leading organizations working to end childhood hunger in America invite participants to host their own bake sale anywhere in the US from May 19- August 31 and send their proceeds to Share Our Strength to help organizations in their community end childhood hunger. Since 2003, the campaign has raised over $3 million and engaged more than 1 million people in baking, selling or buying goods. Because no child deserves going to bed hungry, we invite each and every one of you to get your muffins, cupcakes and brownies pans, have some friends to join the fun and start the fight to stop Childhood Hunger in America one cupcake or one brioche at a time. Sift the flour and salt into a bowl and stir in the stir in the sugar and yeast. Add the eggs and milk and start incorporating it slowly to the dry ingredients. Knead until the dough is fairly soft and elastic. The dough should feel softer and lighter than bread dough. If the dough is too sticky, add flour a little at a time while kneading. Add the butter to the dough, a few pieces at a time, alternating it each time with a little bit of flour to help the butter get into the dough. When all the butter has been incorporated, transfer the dough to a clean, lightly oiled bowl. Cover it with plastic film and let it rise for at least 1 hour in a warm, draft-free room. Lightly grease 20 individual brioche tins set on a baking sheet. 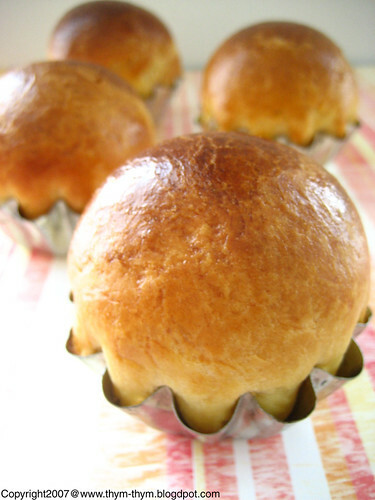 Divide the brioche dough into 20 pieces and shape each into a smooth ball. Place a small chocolate square into each ball and bring up the sides of the dough while pressing the edges firmly together to seal. Smooth the ball by rolling it between your hands and place it, join side down, in the prepared tins. Continue with the remaining brioche pieces, cover and leave them for about 30 min or until doubled in size. 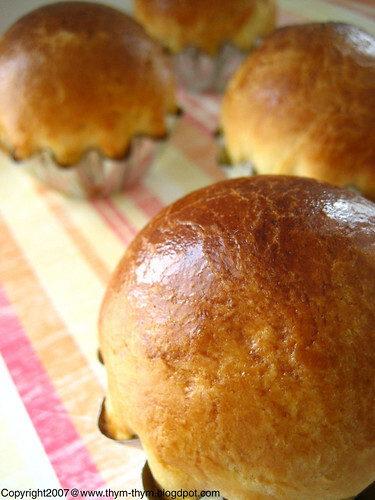 Brush the brioches with beaten egg and bake in a preheated 400F for 12-15 min, until well-risen and golden brown. Let cool on a wire rack slightly, turn out of the pan and serve warm. 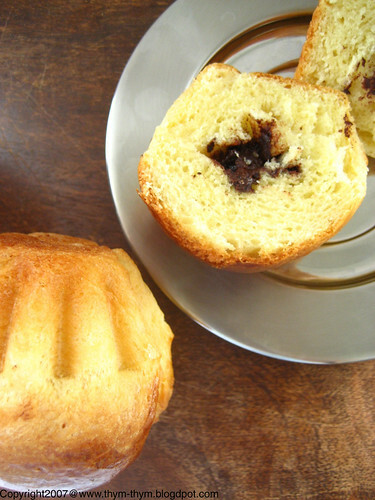 Tips: If you intend serving the brioches for breakfast, the dough can be left overnight in the fridge. Brioches freeze very well for up to a month. Thaw overnight at room temperature, and then reheat on baking sheet in a low oven until warm. Tamiser la farine et les sel dans un grand bol. Ajouter le sucre et la levure, puis verser dessus le lait et les oeufs. Incorporer doucement le malange lait a la farine. Petrir la pate jusqu’a ce qu’elle devienne lisse et souple. Si la pate est collante ajouter la farine petit a petit tout en petrissant. La pate doit avoir une constistence plus legere que celle du pain. Ajouter les morceaux de beurre petit a petit, en alternant a chaque fois avec un peu de farine pour faciliter l’absorption du beurre par la pate. Quand le beurre est entierement incorpore, transvaser la pate dans un bol propre et legerement huile. Laisser reposer pendant 1 h, ou jusqu’a c que la pate soit double. Diviser la pate en 20 petits ronds. Dans chaque rond, mettre un petit morceau de chocolat et rabattre les bords dessus. Rouler en boule et mettre dans des moules a brioche huiles en faisant en sorte que la “fermeture” soit dessous. Continuer avec le reste des brioches. Couvrir les brioches d’une serviette et laisser reposer 30 min. Badigeonner les brioches de l’oeuf battu et faire cuire dans un four prechauffe a 200 C pendant 12-15. Laisser refroidir sur une grille a patisserie et servir tiede. Petites astuces: Si vous compter servir les brioches au petit dejeuner, vous pouvez laisser la pate, avant de la former en boule, au frigo pendant toute la nuit. Les brioches se congelent trs bien pendant 1 mois. Laisser les brioches a temperature ambiante la veille, puis les faire chauufer dans un four doux. Servir tiède. These look SO gorgeous, and I love the little chocolate piece buried inside. Good of you to spread the word about S.O.S. I am in the middle of helping Old CHef for a fundraiser tonight for S.O.S. I love baking for a cause. Great looking brioches. 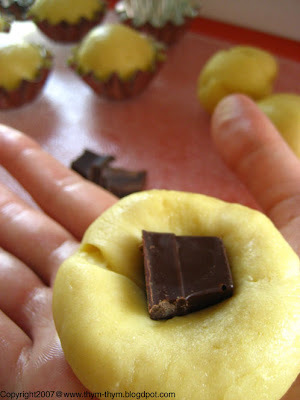 My favorites have chocolate or almond paste inside...yum! First I thought the brioche looked fantastic... and then I saw that, in addition to all that golden fluffiness it also has chocolate inside. Wow! I swoon. These look absolutely fabulous! I know what I am going to bake tomorrow! (And use my little tartelette forms too!) Thnks for the recipe! I love baking for a good cause, been doing that since high school. It's great that you are highlighting this issue. Your brioche looks lovely. 12 mio ??? mais c'est énorme...je vois qu'en visitant les EU comme touristes, on voit pas trop ce genre de problèmes...et c'est dommage. Bravo pour ce billet !!! What a beautiful and moving post, Rose! There are many people here who live in poverty, too. It's heart breaking. This project sounds so great. Your brioches are fantastic! I've been meaning to make chocolate brioches forever! Thanks for writing about SOS and the Great American Bake Sale. I was on the board of Boston's Operation Frontline (a SOS teaching program) for many years, and it is still near and dear to my heart. Thanks to all who are helping by baking or buying during this event. - I am glad you like it Deb. - That's very rewarding indeed to bake for a cause Helene, especially when it involves children. - Merci beaucoup Sha pour ta generosite.Tes jolis muffins auraient ete parfaits pour l'occasion. - Thanks Ari. It is all about the chocolate when I bake Brioches. - I am glad that you like them Karen. Let me know how it goes. - J'etais aussi tres retissante a l'idee de faire mes propres brioches, mais crois moi Loukoum une fois tu mettras la main a la pate, tu ne pourras plus t'arreter. - I saw a while ago one of your actions Nora and your cakes have always been so successful. - Malheureusement Claude tout n'est pas rose dans la vie. Merci pour le message. - Thank you very much for your kindness Patricia. - It's an honor for me Lydia. Thanks to you too. - Kelly-Jane, thank you very much. We should all thank SOS organization for their support. - Merci beaucoup Ma chere Mima pour ton message tout en poesie. What a *great* idea... I've suggested to my HR department that we do a company bake sale and donate proceeds to Share our Strength. Can't wait to try your brioche!